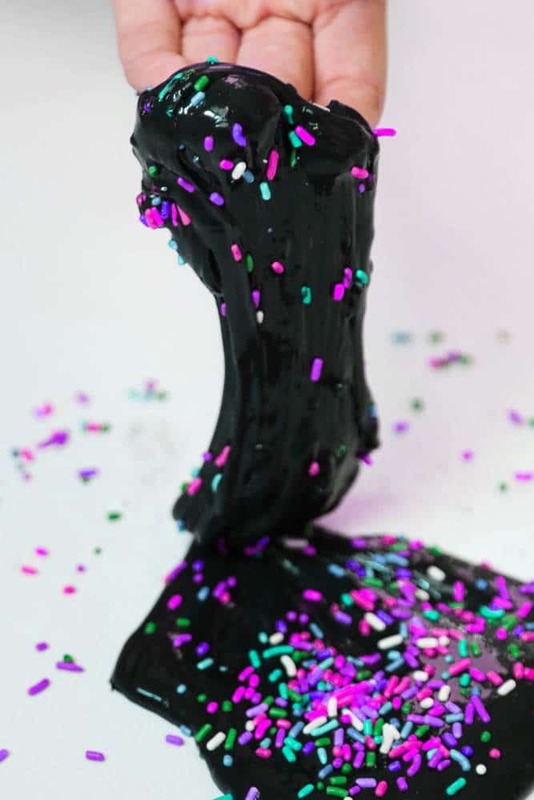 If you’re wondering how to make slime without borax, earn how to make galaxy slime with this fun galaxy slime recipe using liquid starch and glue. We have always been fans of DIY galaxy crafts since our first galaxy activity here. Most of the universe slimes we see out there use glitter, sequin and glue to produce the effect of stars and planets. While glitter galaxy slime look very pretty in the beginning, when the colors eventually mix up you will get get a purplish/brownish slime that can only be fixed by adding more colored smiles (which will time mix again). 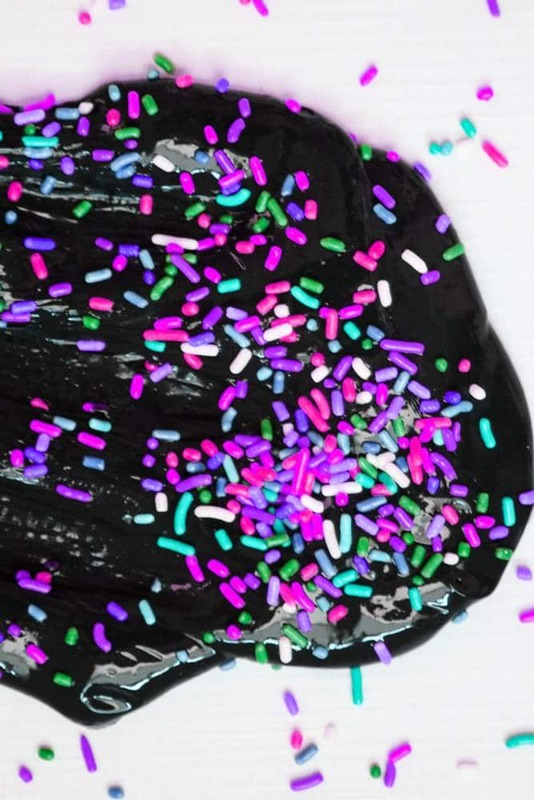 Whist this is not such a problem and we all know the colors mix, I decided to use a different approach for my galaxy slime putty; to make it totally back and add colored sprinkles! I am always trying to add that little bit extra sensory processing feature to our slime, like we have done with the Pompom Slime and the Pineapple Slime, so here shouldn’t be different! 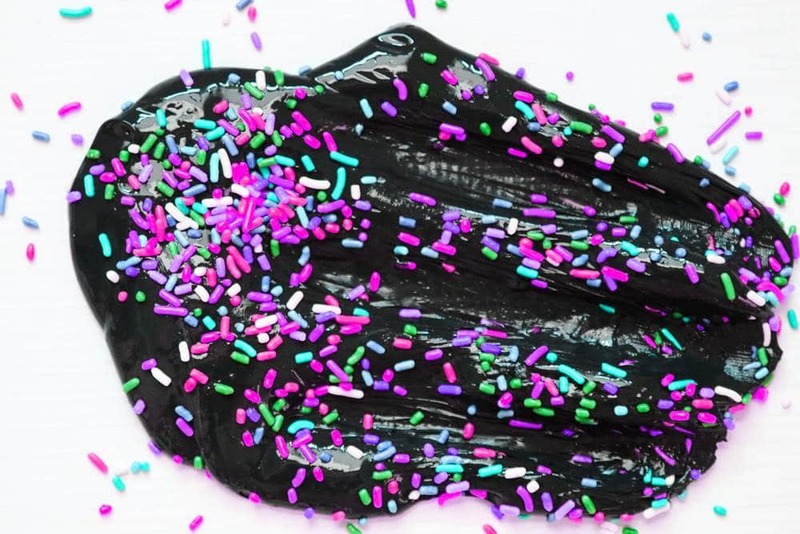 The sprinkles add color and texture to an otherwise plain slime. 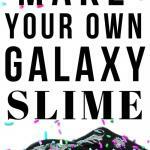 So read on for our full tutorial on how to make slime galaxy theme. Check out our 50+ sensory activities to try at home today with the kids! This time we used a different recipe for slime. 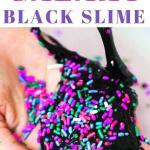 As you may know, there are several recipes for slime without the use of borax. 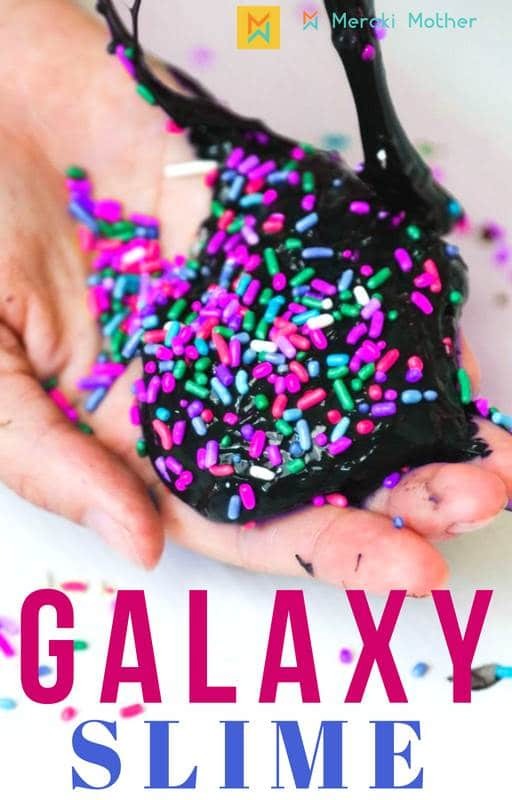 It has been reported that some people have reactions with borax so this borax free galaxy slime recipe is perfect if you are looking for a different recipe. Follow along to learn how to make slime without borax. 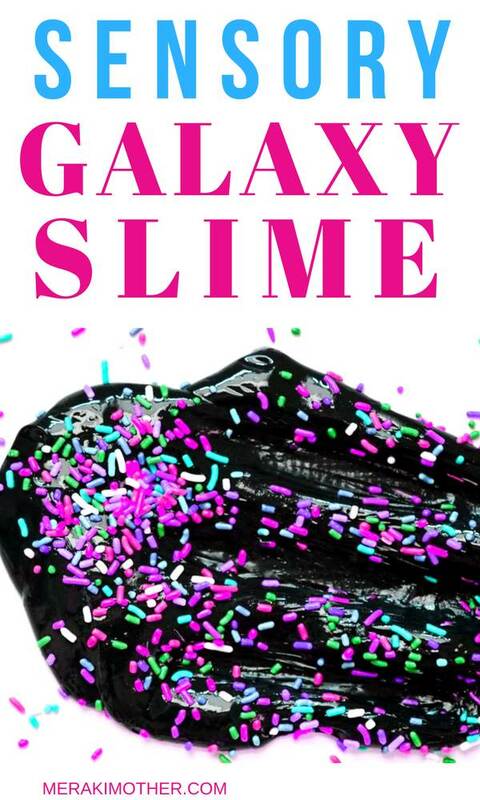 What do you need to make galaxy slime? Slime is a science experiment meet art project, meaning that you get better at it the more you practice. I have made several fail slime recipes over the years even when following the recipe to a T.
The thing is; the materials used, the room temperature, the sequence of adding ingredients, the precise amount added and how you mix it all have an effect on your end result. It is like baking a cake, even though the recipe is right in front of you and you know everything you need to know to produce a fluffy cake, sometimes it doesn’t work out! The good news is that you get better and will find what works for you! So don’t get discouraged by failed slime, most of the time you can fix it or just adjust ingredients. You can also sometimes repurpose fail slime into putty or play dough by changing the ingredient rations – once I was trying to make a cornstarch slime but it wouldn’t stretch enough, so I add more cornstarch and made the softest playdough ever! references and you uses materials that you can find locally. That being said, some slime recipes are easier than others to set on a good consistency, and the liquid starch slime is definitely one of those! There are 2 ways that you make your own galaxy slime with liquid starch – using only glue and liquid starch or adding water as well. Both ratios work, yet I advise you to make a small batch of each recipe to see which recipe you like best, which takes less time to knead and which of them give an end product that suits your preferences. Set all your tools and ingredients to make galaxy slime after you have decided which ratio of materials to use as explained above. Remember that some people prefer runny slimes while other may prefer a thicker slime. You can try adding less water to your mix or adding the laundry starch slowly until you get the perfectconsistency. Step 1: If you are using the recipe with water, mix them well together in a bowl. 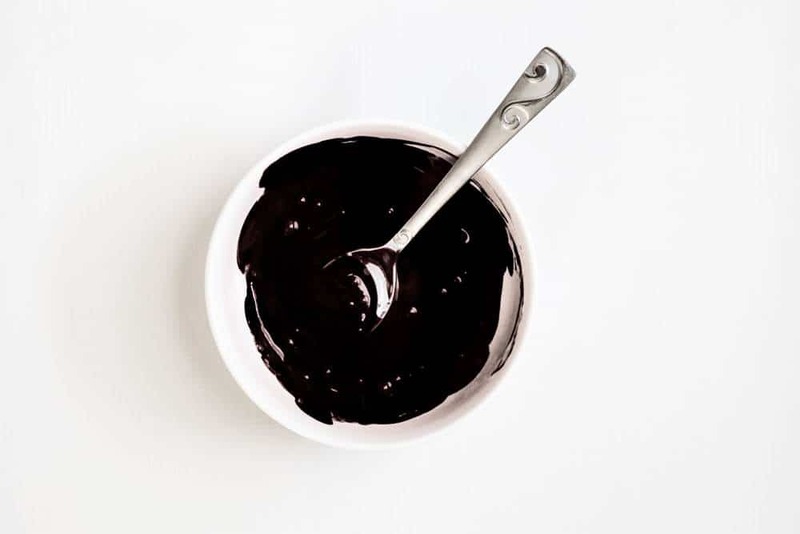 Start by mixing your black paint to the glue (or water and glue combination), just keep adding black color until you get a smooth black shine mixture that will be the color of your homemade galaxy slime. Step 2: Now add the liquid starch to the mixture and mix it heavily for a couple. Slime will start to form. It will have a weird looking texture to start with, it is normal. You might see some parts that do not mix well so mix for another couple of minutes to help it bond together. If there is still liquid left, discard it. Step 3: Let the smile rest for a couple of minutes and then and start kneading it. It might be a little bit sticky at the beginning but after kneading and playing with your slime for a few minutes it should not be sticky at all. 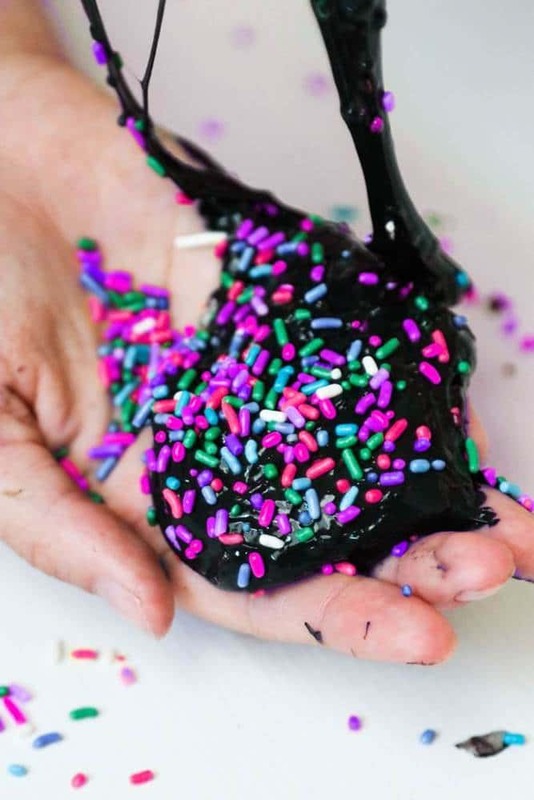 When your slime is ready you can add your mix of jimmies to it to give your slime the galaxy look! I hope you have enjoyed this How to make a galaxy slime tutorial! What is your favorite slime recipe?